Editor’s Note: This is a part of a package of stories about the state of criticism. See the links at the end for the related stories. I have a well-deserved reputation in my family for relying on critics to make a lot of purchasing decisions. That I’ve bet my career, in large part, on the value of the critic probably betrays my bias, but I am, in many ways, the person I am today in no small part to the cumulative wisdom of critics who, for better or worse, picked up where my formal education left off, introducing me to the worlds of theater, art, dance, cinema and cuisine. Life is short and money is precious, so why waste either on the mediocre, or worse? But the future of criticism, at least as a profession, appears to be in grave peril. Barely a week goes by without the announcement that another long-term critic has been cut from a job, not for performance, but because the employer no longer can afford it, or considers it no longer essential to its mission. Most recently, the trade paper Variety, the bible of the movie business, laid off its esteemed film critic, Todd McCarthy, along with its lead theater critic, David Rooney. Variety, which reviews more than 1,200 movies a year, is usually the first voice on a film’s prospects, both critical and financial, a voice that might at a time have influenced the movement of millions of marketing and distribution dollars toward or away from a movie it favored or fragged. Virtually the same day, The Wall Street Journal parted ways with its restaurant critic, Raymond Solokov, a well-seasoned veteran. And so it goes, and has gone, week after week, for the better part of the last decade. The “villian”? The internet, of course. Not only has the perception that its rise means print’s demise gutted newspaper and magazine ad revenues, forcing the draconian budgeting decisions, so has the rise of its new modes of “reviewing”—social-media applications like Twitter and amateur review sites like Yelp at the forefront—led to an increasing notion that old-fashioned criticism has lost its audience and its relevance. The great fomentors of these notions? The newspapers themselves who, so unaccustomed to the vagaries of economic downturns have perpetuated a public cycle of suicidal hand-wringing in their pages. Whether they’re right or not, no one really knows. A powerful case can be made for the vitality of print as a medium, but that is not the topic today. If, in fact, online venues are filling the void with powerful, homegrown critical voices dedicated to the craft, so be it. But if not, someone needs to hold a hand up in the air and say, “Stop!” Before we watch the underpinnings of contemporary cultural conversation disappear entirely, let’s consider what we might be losing, what we’re apparently replacing it with, and whether it really is a Darwinian inevitability. After all, since each and every one of us is spending thousands of dollars to prevent market forces from exterminating the Wall Street bonus machines and the Detroit pollution-mongers, maybe, just maybe, our cultural future is worth, oh, spending a few hours or even days thinking about it. A few weeks back, I was on a panel discussion hosted by the Department of Cultural Affairs on dance criticism, along with the lead dance critics or editors from the Chicago Reader and Time Out Chicago. Between the three of us, we were responsible for the lion’s share of dance coverage in Chicago. (Neither daily newspaper has a full-time dance writer, in spite of the city’s extraordinarily strong dance culture.) I was excited about the prospects for the event; a lively interchange between critics, dancers and dance professionals about what we do, and what we can do better. And likewise, for them. But as I looked out over the audience, I saw a depressing sight. Perhaps a third of the seats were filled and those, except for a couple of publicists who represent performance companies, were occupied by friends of the panelists and employees of the DCA. No one even cared. Critics, as a class, have never been especially popular. Artists hate those who criticize them, and love those who shower them with praise. Many reflect the sentiment that the late novelist and critic John Updike articulated in a collection of his essays and criticism, “Writing criticism is to writing fiction and poetry as hugging the shore is to sailing in the open sea.” It’s easy to think that critics are nothing but a bunch of failed artists. And yet, the artistic canon we enjoy today might not exist for the practice and encouragement of critics. Chicago’s legendary theater critic Claudia Cassidy, who lorded over the scene from the forties through the sixties, is widely acknowledged for having championed the emerging playwright Tennessee Williams and his “Glass Menagerie,” which had its world premiere in Chicago. Without her, would we even know about “A Streetcar Named Desire” or “Cat on a Hot Tin Roof”? Would they even have been written by a more discouraged playwright? No one knows, but perhaps, we’re on the verge of an experiment to find out with the Williams of tomorrow, who might not have his champion. But it’s not just the artists who hold their critics in disdain. So too, many members of the public who believe (not incorrectly) that anyone can and does have an opinion. And now, thanks to the internet, everyone truly is a critic. And if everyone’s a critic, is anyone? Yelp, founded in 2004, now covers thirty cities, was visited by twenty-six million people in December 2009 and features nine million local user-generated reviews. Not the first city guide online to aggregate user-generated reviews—Citysearch, Metromix and just about anyone in the game had done so previously. But Yelp took out the editorial filter: users did not augment the critical voice, they were the critical voice, in aggregate. And Yelpers could review just about anything in a community—the people were in charge, not the editors. Add in a healthy mix of social-networking enhancements and a well-constructed user interface and simple but memorable name, and before long, they were a force to be reckoned with across the nation. Hundreds of amateur critics, everday people, were rating and reviewing in a crowd-sourced manifestation of critical democracy. The infinite monkey theorem was being proven. Or was it? Before long, reports broke out across the country of Yelp’s ad sales reps strong-arming local restaurants and retailers to advertise, offering to manipulate the establishment’s polling results to eliminate or reduce the influence of negative reviews and, nefariously, to plant more negative reviews if they refused. While Yelp continues to officially deny this, a class-action lawsuit was recently filed against the company in U.S. District Court in California accusing Yelp of extortion. Since it was filed, nine small businesses have joined the suit, moms-and-pops from far-flung cities like Washington D.C., Los Angeles and, here in Chicago, Bleeding Heart Bakery. Though it’s possible that a few renegade sales reps were telling tall tales on their own, and anyone who’s ever managed ad salespeople know a few capable of such, the breadth and pervasiveness of the “smoke” points to something a bit more systemic, whether officially sanctioned or not. American journalism has a long-established wall between the church and state of editorial and advertising, but Yelp wasn’t started by journalists and likely doesn’t see itself that way. In the absence of the long-articulated ethical standards by which the media self-polices (often to a fault), the actions of which Yelp is accused might even seem downright reasonable. Every city has at least one print publication of dubious editorial quality that makes it a practice to package “stories” with ad buys, after all. But there are greater concerns with Yelpism than ethics, or the platform granted for truly obnoxious loudmouths. The premise of Yelp is a statistical one; that a crowd is going to be right in its collective wisdom. The problem with this is that in most cases, the sample of contributors is far from statistically significant and thus prone to potential bias. Save the chronic contributors, called “Elites,” who fancy themselves arbiters of opinion but who have not found a traditional media outlet for their output, either due to skill or choice, most of us are only inclined to go to the effort to put forth our views when our experience is far outside the mean. That is, when we have an extraordinarily great or, more likely, especially bad experience. The silent majority who’ve found the establishment good, adequate or slightly below average stay silent, turning the platform over to the outliers. The result is that the thousands of “polls” that make up Yelp’s database are far from statistically significant and prone to potential manipulation, either by an establishment convincing friends and family to weigh in with positive reviews, or by an unhappy customer doing the same. The problem is that users may not consider this, and a negative review might have a disproportionate negative impact on a business’s ability to attract customers. That a sample size of one is even less significant is inarguable, but it’s a different conversation. The professional critic earns his or her authority by virtue of their cognitive skills, life experience, writing ability and the reputation of their outlet. Their audience recognizes the singularity of their voice and opinion and modulates its response accordingly. We find the critics we relate to and discard those who do not. Long before Yelp staked out its digital turf, Nina and Tim Zagat had established their surveys of restaurants as an important voice in the form. But voting for the Zagat guide had a more filtered, seemingly scientific methodology to it and was initially limited to those invited to vote based on being especially knowledgeable consumers. Though Zagat surveys had plenty of faults of their own, including accusations of being too much of a closed circle of contributors, they offered a reasonably credible way for the people to pierce the exclusivity of the critic’s club, in a way that augmented, not replaced the critic’s role. It was a workable balance, if far from perfect. The challenges in vetting participants that any survey like Zagat, including our own Best of Chicago audience poll, faces in order to enforce ethical credibilty increases exponentially for the likes of Yelp as its contributor base and markets covered grows. 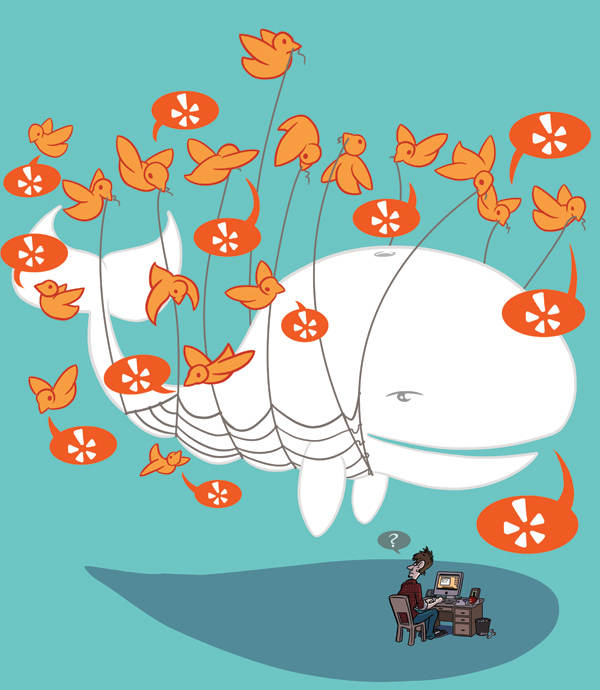 If working critics despise what Yelp is doing to their domain, then they love Twitter. Twitter and, in a similar way, the Facebook status update, allows a real-time continuous brain-dump/upload from a self-curated group of followers and followed. And it accentuates the race to opine: last year a debate raged among local restaurant critics (including our own Michael Nagrant), chefs and related food folks about whether a Twitter take issued by Steve Dolinsky after a visit to Big Star on its opening night constituted a “review” and if so, was he playing by the “rules.” Before too long, the debate moved itself to the less-confining and more “established” venue of Facebook. These debates, really a digital version of taming the Wild West, are more engaging than nefarious. But only a miniscule fraction of the millions of Twitter users are professional critics, though skeptics might suggest the latter bloviate far beyond their numbers. The “masses” are spreading their “reviews” freely and without any contemplation of ethics or consequence. And services are springing up to aggregate these reviews, like a Frankenstein Yelp, to create critical consensus, to wrangle word-of-mouth. Here’s a Reuters headline from last fall: “Hollywood is increasingly relying on Twitter and Facebook to gauge popular buzz on movies even before they come out, in a move reflecting the power of average filmgoers over once-mighty film critics and detailed surveys.” More power to the people. What hope then for the poor little critics? The latest debate is over the growing use of proximity-tracking capabilities, epitomized by the iPhone’s GPS, with various ways of interacting with venues. Think of one application as the personally crowd-sourced proximity-dependent critic-on-demand. “Hey, I’m in Bridgeport tonight. Anyone know where I can get a decent cocktail?” While privacy concerns are real, the appeal of this is significant. My friends network is now my meta-critic. The meta-critic is not new on the internet. Why follow a particular critic you like, or have access to via the local paper, when you can get a quick fix on the aggregate opinion of hundreds of critics via sites like Rotten Tomatoes? Of course, with established film critics losing jobs by the dozens, what does this portend about the data in Rotten Tomatoes? Will the sample size shrink down and down and down, or will they substitute the Manohla Dargises and Michael Phillipses of the world for a larger serving of the Harry Knowleses? Can that be a better thing? Those of us who rely on critics in an old-fashioned way are just as inclined to read their review after we’ve seen a movie or eaten at a restaurant as before. We seek understanding, deeper insights into our experiences. Sometimes even more. But conventional media hastened its own fate long ago when it started adding reductive, scannable data to its reviews with star systems and points. This information was the data that would add to its decline, since it was easily reduced to aggregate consumerism, a simple thumb, up or down, without a voice attached. It’s hard to imagine our culture will ever create another Gene Siskel or Roger Ebert; bona fide celebrities by virtue of their roles as critics, serious critics writing about movies for major metropolitan newspapers. With Siskel strucken down more than a decade ago by a cancerous brain tumor and Ebert, diagnosed with thyroid cancer in 2002 and now, as Esquire characterized, “dying in increments,” those times are now past us. It’s tempting to read Ebert’s condition, his inability to speak, as metaphor for our cultural cancer: America’s last famous critic is literally silenced. However, Ebert’s vocal chords may be defunct, but he is far from silent. He’s fought back with a body of written work more prolific, more meaningful than any he’s done before. He writes books, reviews for the newspaper, he blogs and he tweets to a nation of followers, some 113,234 and growing. He Will Not Be Silenced. In his willpower, perhaps we can find hope for his form.